Yep, I know. I'm way way way behind on this post (stop judging! ), but if you've been following along with me on Twitter and/or Instagram, you will know it's been a couple of chaotic weeks. So I say, better late than never people. And who doesn't love the joy of re-living a momentous day? It would be sad if these wonderful photos (that I actually took myself!) were to never see the light of a computer screen! 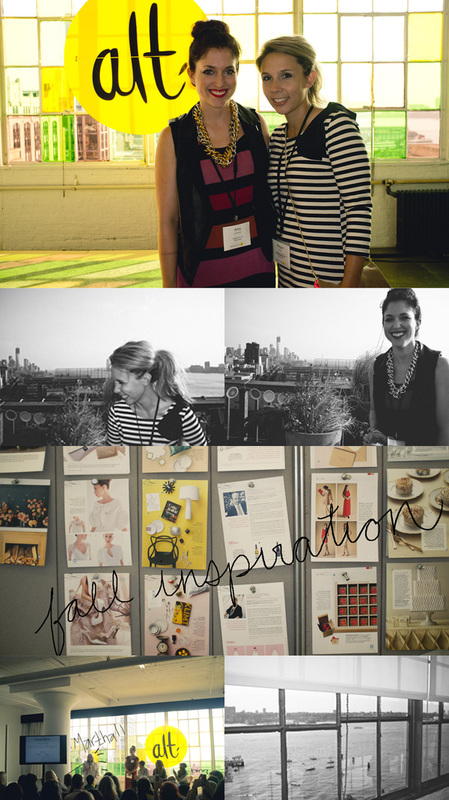 So, just do me the favor and indulge my little heart by pretending you've never seen an Alt Summit NYC post before! After meeting so many new faces and chatting the night away at our Blog Brunch event the night before, Megan and I were basically functioning on little sleep and lots of coffee (read: a day full of delirious giggle attacks!). Few things bring me more joy than getting to sit in a room with so many like-minded creatives and 'talkin shop'. I heard the best keynote ever spoken at a conference by the amazingly talented Tina Roth Eisenberg of.... you know... well, everything.... Swiss Miss, Creative Mornings, Teux Deux, Tattly. You must check out this gorgeous and super smart infographic by Sarah of 'Note To Self' on Tina's talk. We got to tour the Martha offices, staring at the dear employees like viewing animals at the zoo in their natural habitat. I apologized and then gave them the half-smile look of 'sorry we're not sorry we're poking around in your office'. We then proceeded to their stunning rooftop for some mingling and champagne served by male models/actors..... this is New York after all. Thanks to Bing, Martha Stewart and everyone who helped put Alt Summit NYC together. Let's do it again soon! Are you one of the lucky few who snagged a ticket to the uber popular Alt Summit conference being held in New York City in mere weeks? If you are, then this week is for you! After receiving tons of emails over the five years I've lived here, it's about time to do my own guide to the city. And what better way to start than with a guide directed and made just for all you fellow bloggers, designers and creatives who will be descending upon this fine city in honor of Alt Summit! Today we are going to kick off my Alt Summit NYC Guide with what is probably my favorite part of this city...... the food! New York has almost too many options for places to eat, and honestly, it can be hard to decipher between the good, the bad and the ugly. Everyone comes wanting one of those dining experiences you can reference with such joy when you reminisce about your trip to the city. No one wants to just end up in the overpriced tourist traps or eating the soup and salad combo at Olive Garden in Times Square. You're in NEW YORK CITY! Let me help you eat your way through the boroughs. Let's start with a few 'need-to-knows' so you can have the best experience throughout your meal. 1) Be sure to check ahead of time if the restaurant is 'cash only'. A lot of places tend to be in the city or they have a minimum to use your cards. If you're caught without cash, their in-house ATM usually carries a hefty fee. 2) Splitting a bill four ways on credit cards is not the same as it is in most cities. If you find yourself needing to split a bill unevenly across multiple credit cards, be sure to write out on the back of your ticket the last name of each card user and the amount to place on each card. This should restrain your server from using an overly dramatic eye-roll upon picking up your bill. 3) If you've heard a place is good, it's likely that 10,000 others have as well. You're on an island that holds nearly 13 million people during the work week. So, do call ahead of time to make reservations, or to just check what the wait may be if they don't take reservations. Most places will give you a general 'waiting time' idea. It's never fun to get really excited to eat, only to discover, it will be another 3 hours before that's going to happen. You can't come to New York in the summer and not visit the original Shake Shack! It's one of those staple places. Famous for their burgers, shakes and one-of-a-kind beer made by Brooklyn Brewery, you are in for quite a summer treat. Don't let the lines scare you off, stay strong and be sure to check the 'Shack-Cam' before venturing over just to get a glimpse of what you're in for. Brings water and snacks! Literally across the street from Shake Shack is the world's largest artisanal Italian food and wine marketplace. Thanks to the brains of Mario Batali, Lidia Bastianich and Joe Bastianich, this 50,000 sq foot food hall complex and grocery store almost feels like you've been transported into a different world. Take my advice and skip the sit down lines (they are kind of a circus!) and opt for the stand-up wine and cheese restaurant - La Piazza. It's fun, fresh and I highly suggest ordering a handful of different appetizers and cheese plates and sharing amongst your group..... of course paired with a glass of wine. A perfect lunch spot full of magical sandwiches you'd think were thought up by a bunch of four-year-olds. Roasted cauliflower with potato chips and honey chipotle? Gross? Wrong. Try one bite and you realize that these sandwich combos are in fact pure, straight up genius. The sandwich combos change daily, but I guarantee, that every one is delicious. I've see some wacky concoctions posted in that place and have never once had a sandwich that wasn't crazy shockingly good. Bonus :: when you're finished, you can waltz around the corner to the Ace Hotel for a cocktail or coffee. If it's a cozy neighborhood Italian place with familiar smells and delightful decor is what you're looking for, well good, cause Frankie's is where you should go. I'd suggest the Carroll Gardens location over the Manhattan based one, but since that could be a far trek if you're only in town for a few short days. Burger & Barrel - insanely good burgers and cocktails. Grape & Grain - best ambiance. Cafeteria - their mac & cheese is famous. Locanda Verde - the neighborhood Italian taverna. Westville - it's a go-to and is nothing fancy. which is just why people like it. The Smile - because it's hip and they have delicious cappuccino. I'm not above 'hip'! If you're feeling adventurous, then head out to Bushwick to this amazing pizza joint set amongst the warehouses and lofts of East Williamsburg. The experience and food are worth the trip alone. Creative pizza combinations, delicious tap beers and a stellar outdoor space (which is like gold in New York). Bonus :: mention to anyone you've been here to eat, and you'll immediately get 10 cool points! It's our neighborhood secret spot. BYOB and the most delicious French Caribbean menu you've ever tasted.... if you're the kind of person who has tasted a lot of those kinds of things! Just don't tell anyone.... we wouldn't want the word getting out, shhh! Also, they don't take reservations, so show up early. Bonus :: if there's a wait, they'll let you open your wine bottles and start drinking. If ever the wedding between BBQ and whiskey was always as glorious as it is here. It's a seriously hipster place to walk into (it's located in Williamsburg after all..... need I say more), but once you start eating, you won't care who's around you watching. It's that good. Hope these are a good starting point for those of you visiting the city in a couple of weeks. 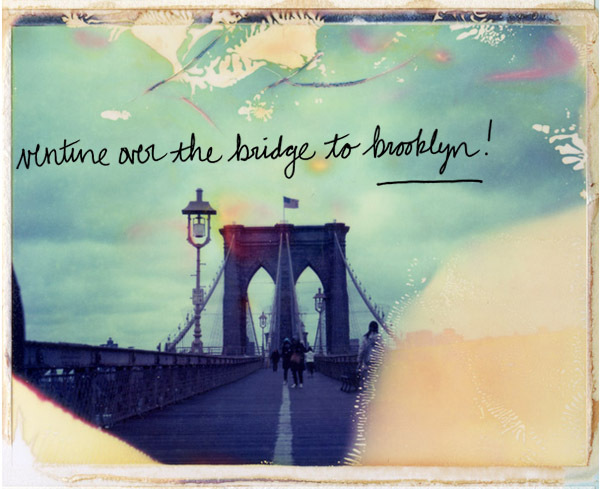 Check back this week for my picks of where to drink, shop and the secret spots of locals!